I know that this isn't a brand new image, but it is amazing. Look at the incredible stellar streams of these interacting galaxies! Look at the remarkable "boxy" bulge of NGC 128, indicating a very prominent bar structure. Look at the amazingly red and pink starburst in small galaxy NGC 127, even though there are few signs of ongoing star formation in the other galaxies. And look at the fantastic tidal "bubble" of NGC 125! This is such a remarkable galactic zoo! This is the southern part of the supernova remnant G65.3+5.7 and the bright red "star" is a planetary nebula with the interesting name of Campbell's Hydrogen Star. Chile’s Atacama Desert comprises over 100 000 square kilometres of arid, barren terrain. However, for astronomers working at the largest ground-based astronomical project in existence, the Atacama Large Millimeter/submillimeter Array (ALMA), some of the most important measurements occur on the scale of just a few millimetres. The ALMA Operations Support Facility (OSF) sits at an altitude of 2900 metres above sea level in the Andes. From here, astronomers, technicians, and engineers can control each of ALMA’s individual 66 antennas, which are located over 2000 metres higher, at 5000 metres elevation, up on the Chajnantor plateau. Getting the antennas up to this plateau presents quite an engineering challenge. Enter Otto and Lore! These huge orange beasts — one of which is seen here — were specifically designed and built in Germany to carry the 100-tonne antennas from the OSF to Chajnantor (a distance of some 28 kilometres). When they arrive, the leviathan transporters position each antenna with millimetre precision. This incredibly exact positioning is crucial to the array’s scientific operations, and enables ALMA to produce some of the world’s sharpest images of the Universe. You can see Otto and Lore in action in ESOcast 56: Gentle Giants in the Desert. 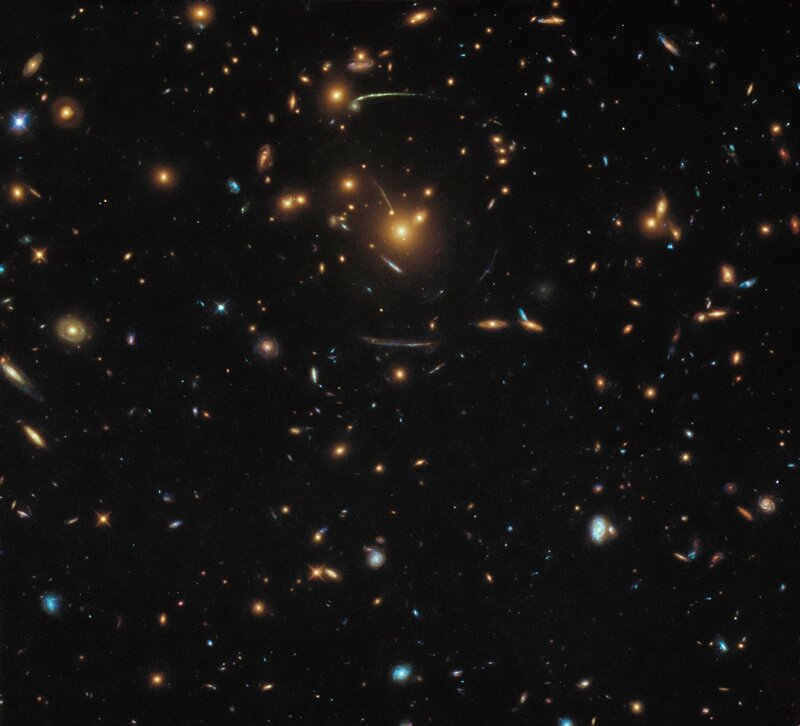 The gigantic mass of this cluster creates the fascinating phenomenon of strong gravitational lensing. The gravity of the cluster bends light coming from behind it in a similar way to how the base of a wine glass bends light. The effects of this lensing can be clearly seen as curved streaks forming a circular shape around the centre of the frame. Astronomers can use these distorted galaxies to calculate the mass of the cluster — including the mass of the dark matter within it — and to peer deeper into the Universe as otherwise possible. Gravitational lensing does not only distorts the views of galaxies, it also enlarge their appearance on the sky and magnifies their light. 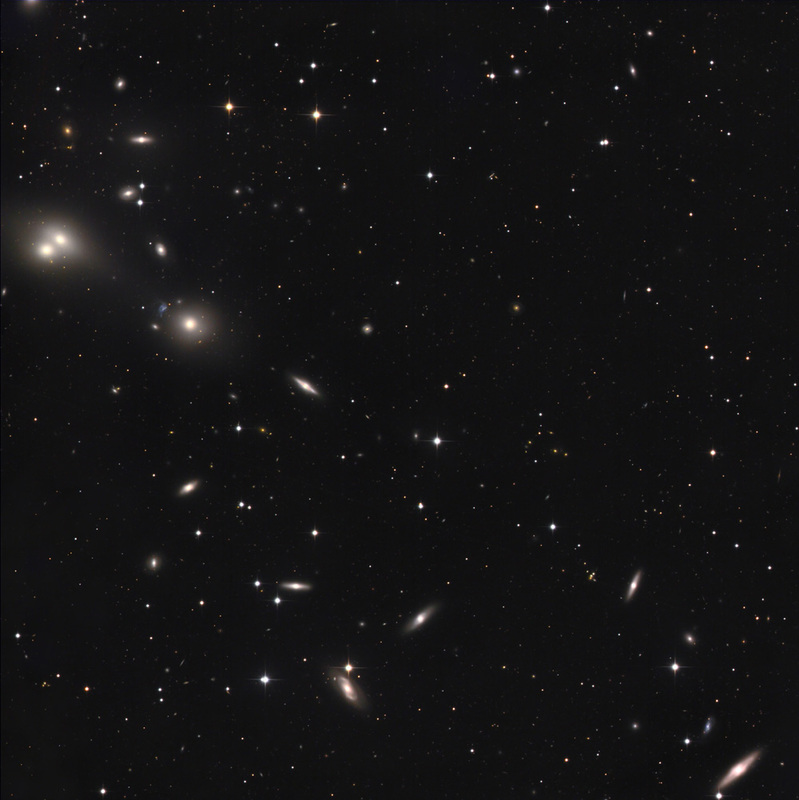 I love these rich cluster and lensed galaxies images!!! Geck, the spacetelescope.org page credits you. You have told us before that sometimes they credit you even if you have had little or nothing to do with the image, but perhaps, in this case, you know something about it? For example, do you know what filters were used for it? I note that the blue features in the image are often sharply blue or blue-green. For example, at middle right, there is what looks like a sharply turquoise edge-on galaxy seemingly falling straight into a sedate-looking yellow disk galaxy, which is itself located to the right of a very similar sedate-looking yellow disk galaxy. That turquoise interloper looks weird. Perhaps it is a background object? Or a foreground object? 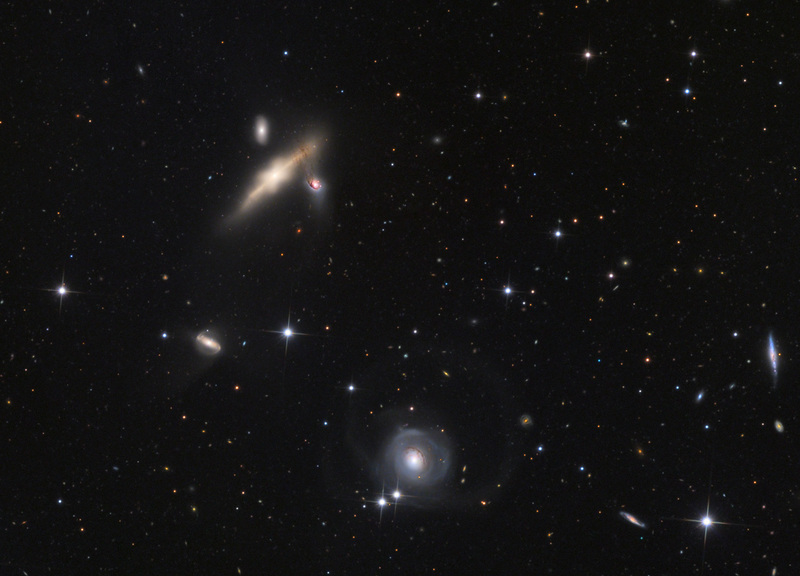 Many of the galaxies in the picture are in fact sharply blue, and others sport bright little blue sites of star formation in their yellow arms or disks. I suppose blue represents redshifted ultraviolet light. Knowing what filters were used for the image would be helpful. So if you can help, Geck, I would be grateful! Knowing what filters were used for the image would be helpful. So if you can help, Geck, I would be grateful! Note that the F160W is assigned to red, the F110W and F606W are assigned to cyan, and the F390W is assigned to blue. I recall these are quite hard to get color balanced because they are so red, hence the color assignment for each filter might seem like it doesn't make sense. Can you explain something to me? Why are F110W and F160W infrared filters, when F390W and F606W are visible light filters? It sounds as if F110W and F160W should detect shorter wavelengths than F390W and F606W, but in reality it is the other way round. What is the logic behind that? Apparently the addition of the infrared instruments to HST were kind of an afterthought, but for some reason they (mostly) constrained the naming convention to three digits. You can think of F110W and F160W as having invisible zeroes on the end before the W. For JWST the same naming convention is retained, even though they're all >1000nm filters. And by the way, thanks for pointing out the other two lensed versions of the green weirdo of a galaxy on your Flickr page. Last edited by Ann on Tue Sep 25, 2018 5:09 am, edited 1 time in total.